Bias or hate crimes are crimes motivated by the perpetrator's bias or attitude against an individual victim or group based on perceived or actual personal characteristics, such as their race, religion, ethnicity, gender, sexual orientation, or disability. Hate/bias crimes have received renewed attention in recent years, particularly since the passage of the federal Hate/Bias Crime Reporting Act of 1990 and the New York State Hate Crimes Act of 2000. 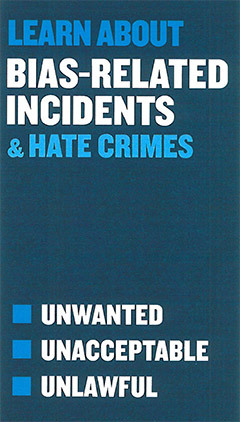 Examples of hate crimes may include, but are not limited to: threatening phone calls, hate mail (including electronic mail), physical assaults, vandalism, destruction of property, and fire bombings. John Jay College is required to report statistical incidence of bias crimes on or around campus annually as part of the Jeanne Clery Disclosure of Campus Security Policy and Campus Crime Statistics Act (the Clery Act). Bias crime statistics can be found in the Public Safety Annual Security Report. Penalties for bias-related crimes are very serious and range from fines to imprisonment for lengthy periods, depending on the nature of the underlying criminal offense, the use of violence or a previous conviction of the offender. Students, staff or faculty who commit bias crimes are also subject to university disciplinary procedures where a range of sanctions are available including suspension, expulsion or termination of employment. In order to effectively handle and investigate incidents of bias-related crimes and prevent future occurrences of such crimes, victims or witnesses of a hate crime are encouraged to immediately report incidents to the Department of Public Safety by calling (212) 237-8524. Please remember that any evidence such as graffiti, e-mails, written notes or voice mail messages should be preserved. The Department of Public Safety will investigate and follow the appropriate college adjudication procedures. Victims of bias crimes can also avail themselves to counseling and support services through the Office of Counseling by calling (212) 237-8111.